Imagine turning up to work only to be sent home without pay. It would be frustrating, wouldn’t it? It would be more frustrating still if you had already paid for childcare that day; or if you’d cancelled other plans so you could work; or if not receiving that day’s pay would make it difficult to make ends meet that week. For millions of people working in insecure jobs, this is what they face every day. These themes are not unconnected or disparate. They overlap and intersect. For example, many workers were frustrated about their inability to make plans. But they felt that shifts had to be accepted, because they needed the money or feared that they would lose out on future shifts. For similar reasons, many workers were hesitant about taking holiday or sick leave. Each theme is underpinned by a lack of control, a sense of being disposable, and a power dynamic that favours the employer. Respondents frequently mentioned frustration at favouritism or unfair employment practices, but felt there was nothing that could be done about these. Even those who were more positive would mention that their current situation didn’t feel permanent: it could change for the worse at any moment. The most common complaint respondents made was never knowing when they would be working. Many talked of being given rotas late, having shifts cancelled on the day, or even being sent home after arriving at work. I get given shifts last minute and other times turn up only to be told to go home (without pay). One bartender working on a zero-hours contract (ZHC) told us how her shifts would often be cancelled on the same day. Even when she did work, she’d be sent home as soon as it wasn’t busy. Short shifts would barely cover the travel costs to work. At the start of each working day, therefore, she had no idea if she’d be working for zero or seven hours, or how much money she would make. This was a common story. Such unpredictably particularly affects those who have to arrange childcare. 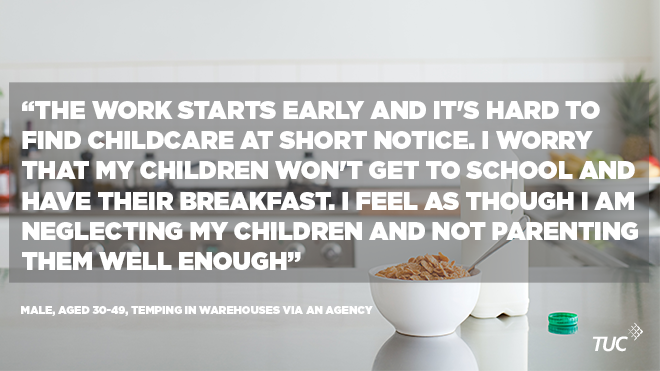 Organising last-minute childcare is fussy and expensive. If a shift is shorter than expected, or cancelled when a worker arrives, this leaves parents out of pocket due to losing work for meeting childcare charges. I can’t make plans for social events as I have been threatened with being fired if I can’t show up on short notice. This led me to be increasingly isolated from friends and family. Workers reported that uncertainty was caused not just by not knowing if they would be working but also by not knowing how long they would be working for. Respondents told us that they often didn’t receive the number of hours work they expected or needed. At the other extreme, others were expected to work excessively. 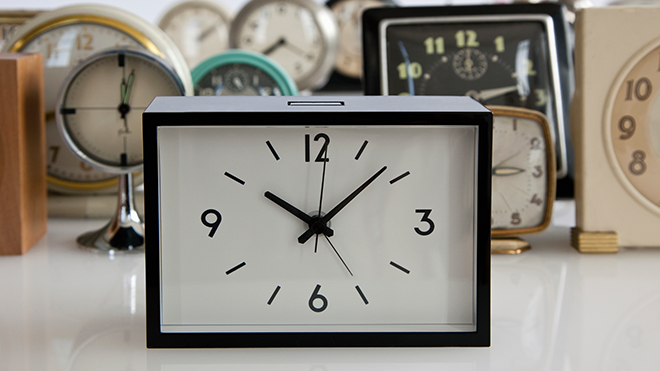 In a lot of instances, workers found that hours flit between the two extremes. They worked many hours one week, only to get little or none the week after. One respondent working in catering told us that her hours are “erratic”. One week, she could be working barely enough hours to pay her rent. The next, she would be working over 50 hours. This wasn’t a unique experience. Others told us that they could be given anywhere between 12 and 60 hours in any given week, often with no explanation. Hours are never guaranteed. It depends whether my manager likes me that week or not. Read more: What are the financial implications for workers of unpredictable work?. 25 years ago I took a contract with Kettle Chips, before I twigged that it was a con – I turned up every day and got sent away as they’d signed up too many people for the work they had. It was a surprise then, but looking at how many people have to deal with that now as normal, it makes me think I’ve been lucky to have regular hours work for more than 20 years now. Don’t want my kids starting work to think that’s how things are supposed to be. I’m a qualified teacher but am on supply at the moment and also take TA work (at TA rate nd refuse to do teaching duties unless paid at teacher rate ie not level 4 TA) Unless i am lucky enough to get a longish term contract eg more than a couple of days at a time – I get up every morning at 6:30ish so that i can be ready to leave at 7:30ish if i get a call. (in machester city you need to leave plenty of time to get there – leaving after 7:45 is a nightmare!) If i dont get a call – that means a day off, but no pay. A few weeks ago I brought home £26 net and a different week i brought home £42net. On a good week as a TA I might get £300. More if i could do teaching but i had a break down a few years ago and have other health issues, so it is out of the question for me to do any more than a couple of days teaching here and there. I only get paid for the days that I work (holiday pay rolled in and deducted for 28 days – I think – confused!) Therefore, I can only earn for a maximum of 9 months a year – because of the wonderful school holidays. Laugh if you wish but last year I was registered with 3 different agencies and my annual income from paid work was £7000c. Yes approx 7 thousand pounds for the whole year! I have a a job in a wonderful school at the moment till summer but it is only 3 days a week so net it is about £160pw. My rent is £110! The other dilemma is – can i get work for the other 2 days. Not looking forward to the 6 weeks holiday without any pay and not a clue about September yet. Please consider workers like me when you think of the plight of agency workers. Just because we work in education it is no different. How can you budget when you don't even know if you'll be working? Care workers for home help support must be among the worst treated of all. My daughter qualified as a teacher when she was 38. She is married with a daughter and her husband is a biology teacher. She also has a law degree as well as English. She was not getting interviewsand very little supply so she took a temporary job in Guernsey. When she got there the head said she had to teach geography. The advert had stated she would be housed in a comfortable modern flat. Her flat had flease and bed bugs. There was no television or armchair. After half term she went home. There is only one way in which to sort all these employment wrongs out and, that is to get this Tory Government OUT. These employment conditions will NOT change while they (just about) hold office. What’s needed now is for all us to get behind The Labour Party that is run by a new leader who cares about people and the working class. All Trade Unionists, All Workers, All Trade Unions and The TUC must back Jeremy Corbyn in getting the Tories OUT. My worry is if we don’t get them out Now, come the Autumn Statement they will sweeten the pil making changes that will Benifit people and, then call an Election. VERY IMPORTANT. What is also needed is for EVERY Labour MP to get behind Jeremy Corbyn and STOP the Sniping and attacks on him and which I might add he has handled Very Very well and with great dignity. A United Labour Party, behind Jeremy Corbyn would be a Strong Party able to WIN the next Election.